A red hot summer box office fed by trilogies has yet another third film of a series ready to lead the way in earnings this weekend. An already impressive box office gets even stronger. Chris Tucker ends his self-imposed exile from the big screen to team up once again with Jackie Chan for Rush Hour 3. The Brett Ratner-directed series, responsible for finally putting Chan over for good in the United States, is the sole entry on Tucker's CV in the past nine years. Obviously Tucker has a fantastic money manager, although the $20 million he got for Rush Hour 2 would give anyone a great start. This blend of action and comedy has proven incredibly popular beyond most expectations, with the first film setting a record for September opening weekends in 1998 and the second setting the August mark in 2001 (broken only last weekend). 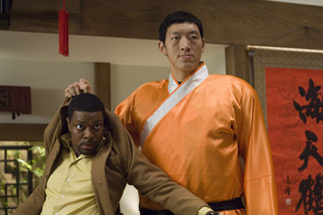 Rush Hour 3 sees Chan and Tucker visiting Paris, where their character's international reputations accidentally draw them into a Chinese Triad gang war. I hate it when that happens.